Ellipse is one of the world’s leading systems with being the only machine with the longest recorded documents showing long term results. Excellent hair clearance is obtained after only 4-6 treatments with clinical long term studies proving that 77% hair is still away after 10 years. Hair removal by Ellipse Selective Waveband Technology is nowadays commonly referred to as laser hair removal although strictly speaking it is not a laser. Owing to Ellipse's square pulse technology and dual mode filtering hair removal by Ellipse is practically pain-free in contrast to many true laser treatments. The light used is attracted to melanin which is found in hair Because there is more melanin found in darker hair the darker the hair is, the more effective the treatment. The light absorbed into the hair causes a heat reaction that permanently destroys the follicle. Treatment will vary in time depending on what area of the body or face is being treated, however the hand piece used for the treatment is one of the largest on the market so the treatment is done at a speedy pace. The treatment sensation varies from area to area and from client to client. As the light energy is absorbed by melanin, the sensation that is felt depends upon the amount of melanin in the epidermis and the hairs, therefore it hurts more in those with dense black hair. Most clients describe the sensation as quite moderate, almost like the snapping of a rubber band, which only lasts a short moment. The most common skin reaction is a mild redness of the skin that normally subsides a few hours to a few days after the treatment. To answer this question we need to understand the hair growth cycle. 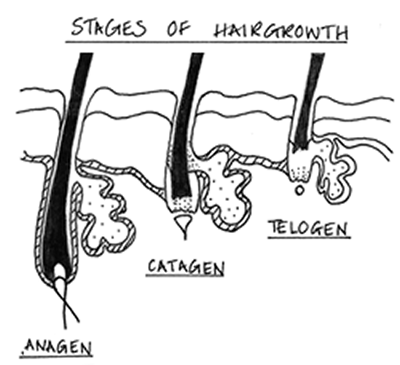 During treatment, all hairs are targeted, but only hair in the Anagen (growth) stage can be treated successfully as this is where the hair is attached to the dermal papilla and blood supply and is most likely to be destroyed. The hairs can be in any of these three stages at any one time. We would therefore recommend 3 – 6 treatments with 4 – 8 weeks intervals for the best results. It is important to avoid hair removal such as waxing etc. you must only shave. Avoid tanning (sun, solarium or self-tanning cream) 30 days before and during the treatment period. Tanned skin will absorb more light which will make the treatment more painful and will put you at risk of burning. People with sensitive skin may benefit from using 100% pure Aloe Vera Gel for a few days after treatment. We recommend you limit sun exposure and use a sunscreen (SPF 30) for a few weeks following treatment. Clients are encouraged to exfoliate the skin 4 days after treatment to encourage the shedding process. No perfumed products, heat treatments or swimming is allowed for 24-48 hours after treatment.